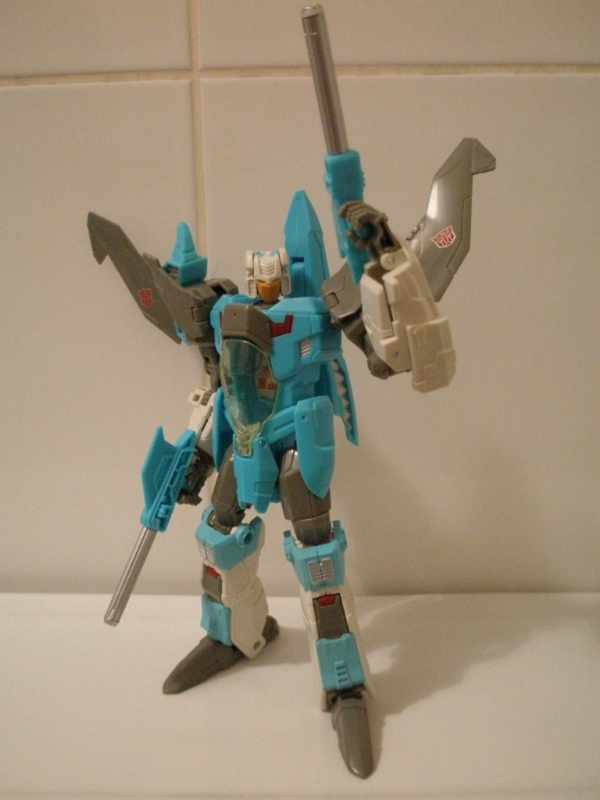 Bio: A genius scientist and diabolical inventor, Brainstorm develops advanced weaponry for the Autobots. Although many of his inventions are deemed too devastating for use in actual combat, it's possible his laboratory itself is his most dangerous creation. Brainstorm frequently ignores proper safety protocols, and an an unwary visitor to his lab runs a high risk of triggering some half-finished doomsday weapon. In spite of this, he is allowed to continue his work, proof of just how valuable Brainstorm is to the Autobot cause. 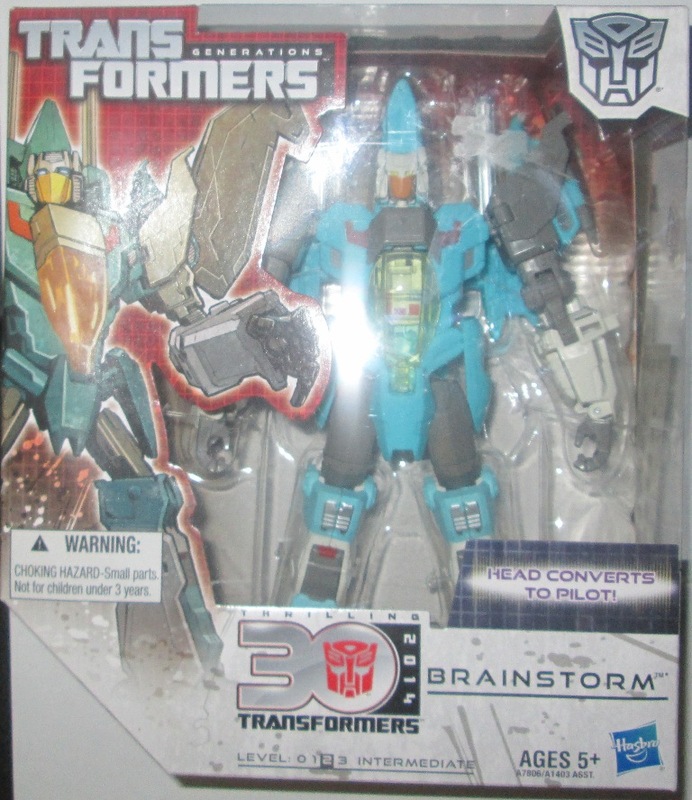 Debuting in 1987, Brainstorm formed part of that years' glorious explosion of multi-coloured plastic. 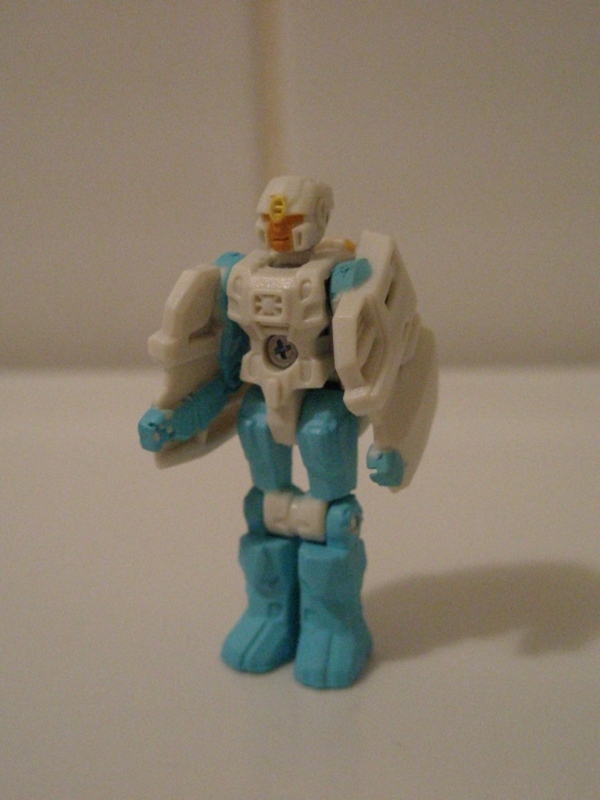 The key gimmick for that particular years' toys was that the main figures would come with a small partner whom could transform into the larger robot's weapon or – in Brainstorm's case – head. The toys were large and colourful, the gimmick was fun (admit it, it was) and it was probably the last year that the original Transformers line looked good, before the stock market crash plunged the world into a lengthy recession that saw future years of Transformers toys become smaller, more cheaply manufactured and ultimately slightly poorer than their earlier releases (No wonder the rubsigns also disappeared in this year). Sounds familiar, right? Brainstorm himself, like the vast majority of post movie characters, didn't really stand out as a character. He got a fair amount of face time in the cartoon, coming up with the concept of Headmasters and Targetmasters in the closing episodes of the original cartoon. The most he did in the Marvel Comics series was get a memorable death scene in Transformers (US) # 75. He did get a more prominent role in the Japanese Headmasters cartoon, where he got to be involved in the magical head swapping circle dance power up thingy. He's ended up with a Generations toy by virtue of being both one of Hasbro's random picks and being one of the prominent supporting cast of IDW's More Than Meets The Eye comic book series. Here, Brainstorm is on the face of it, a weapons engineer whom designs the sort of elaborate and esoteric weapons more at home in Doctor Who or Hitchhiker's. This inherent daftness belies a serious scientific mind and a 'bot with an agenda all of his own. And he invented a time machine powered by briefcases. Awesome. Like a lot of the post '85 characters, Brainstorm easily benefits from the update modern technology can afford the original design and I thought that Brainstorm looked marvellous and had to have a punt on his toy when it came out. 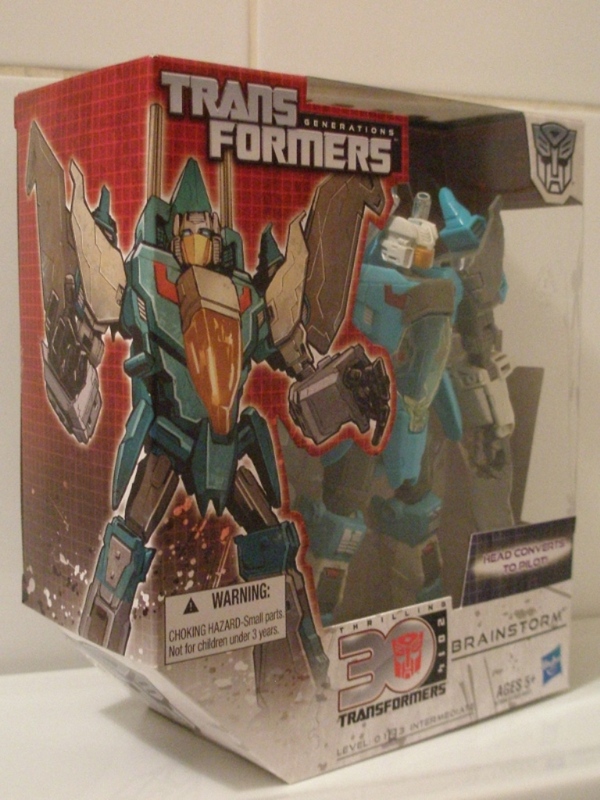 Robot Mode: Brainstorm is a lanky looking fellow and is all arms and legs. He looks great, and also like he's simultaneously going to bust out into tinkering in his lab or transform into spacecraft mode and zip off somewhere. He has this great sense of energy and urgency emanating from his body, due to how lithe and slick he looks. He really captures the soul of the character as imagined by Nick Roche and Alex Milne in More Than Meets The Eye. He does look professorial, with his great tweedy jacket of a turquoise body, with its rolled up sleeves and these big blocky forearms that are no doubt full of tools and stuff. And then there's the hands! Which are splayed in a nice grabbing motion and just look great. Shame about the floppy wrists though. The legs are these nice athletic looking things, all chiseled panels and vents. The feet are perhaps a bit long- they're these great triangular spikes - but give him some great balance. The head sculpt is brilliant, with these tiny beady eyes hiding inside this mass of faceplate and forehead. His silhouette looks fantastic thanks to these great looking wings. There's just the right level of detail on him too, with enough lines and vents to make him look interesting and aerodynamic without overdoing it. Like with Generations Springer, there's a good balance of detailing and plastic colours going on. If there is anything to critique then it is that I feel he could have done with a few more of those red decals the original toy had, just to add that little extra finishing touch. Whilst the palette works well with the silver highlights, just a few bits of red trim would have been great (and a cursory glance at the Japanese Legends version shows how right I am). His twin photon pulse cannons are nice and slick too, and something I'm pleased to see carried over into this new iteration (I always liked that the Autobot Headmasters came with two guns. No idea why, it just looked good). The pilot robot is quite sweet, all gawping mouth and flappy, wing like arms. 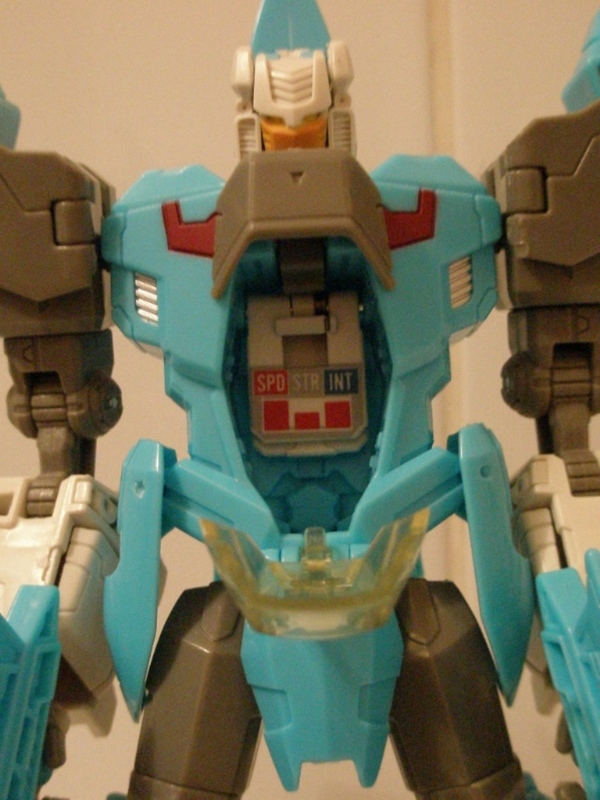 Doesn't really do much to cover up Brainstorm's face though, which hangs off his back like a ridiculous face cape. 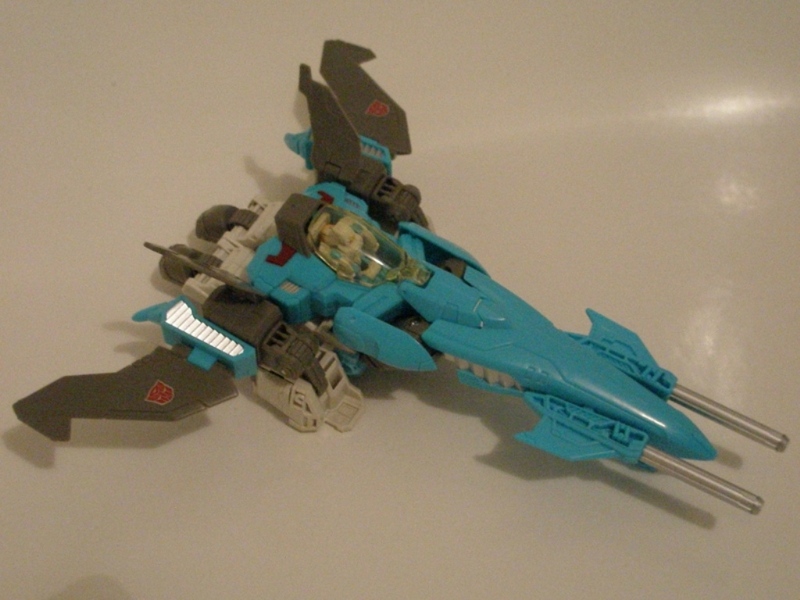 Alternate Mode: Brainstorm transforms into a sharp looking Cybertronian jet fighter. Its a gorgeous looking thing, although best viewed front on. Turning to the rear highlights the huge jumble of arms and legs that aren't even pretending to be concealed. The legs are the worst, extending beyond the reach of the engines to just sort of waft about behind the craft. It's a bit of a shame that this is actually a step back from the original toy, which managed to get the legs neatly tucked away, albeit still retaining that slightly bulky look at the rear. The huge expanse of the wings and the needle-like nose cone do very much distract from this though. The pilot fits neatly in the cockpit, which opens with some good clearance so you can easily get the little guy in and out and there's a comfy chair for him to sit in, which is very cool. The twin blasters don't idle about either, clamping to the front to add some firepower and canard wings. Best of all, he's just really nice to handle in this mode and whiz around the place shooting up his enemies. If you're into that.